Stylo Culture presents a beautiful ethnic Ottoman Pouf Cover studded with embroidery. In this cover vintage embroidered fabric patches are patched and stitched together at random to create a collage like effect and decorated with all kinds of colored threads, patchwork, raised colored thread work and embroidery in intricate designs with beautiful tassel work. 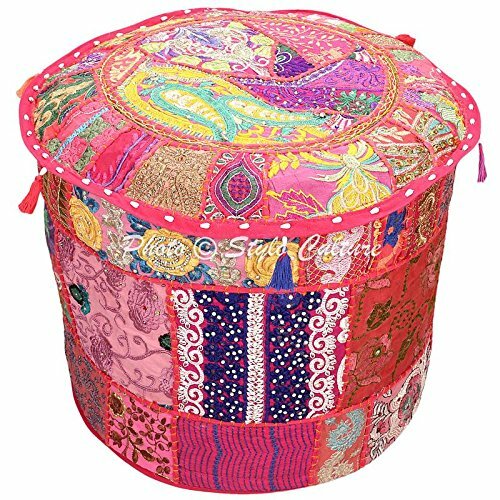 It is a beautiful "Khambadiya" ottoman pouf cover made by artisans in Barmer, India. Witness the exquisite embroidery and thread work on a vibrant cotton backing, creating a stunning collage bursting with gorgeous patterns and colors! PLEASE NOTE THAT IT IS A COVER ONLY AND THE INSERT IS NOT INCLUDED. The pouf cover has a zipped closure at the bottom which can be used to stuff the cover with cotton. The filling can be of cotton, old clothes, beans used in the bean bags or simply you may get it filled from the cotton workers available in your locality. The pouf cover will brighten up the living space in traditional colors. SINCE THE POUF COVER IS MADE FROM VINTAGE FABRIC PATCHES, EACH POUF COVER IS UNIQUE. THERE WILL BE VARIATION IN THE PATCHES HOWEVER THE BASE COLOR OF THE POUF COVER WILL REMAIN SAME. THE UNIQUENESS OF THE PATCHES IS THE SPECIALTY OF THE PRODUCT AS NO TWO POUF COVERS ARE ALIKE. Production Technique: Khambadiya Patchwork. In khambadiya technique the vintage embroidered fabric patches are patched and stitched together at random to create a collage like effect and decorated with all kinds of colored threads, patchwork, raised colored thread work and embroidery in intricate designs with beautiful tassel work. The pouf covers are made by womens from India residing in the rural parts of India. Care Instructions: Dry clean only. Disclaimer: Color may slightly vary due to monitor resolution. Since the pouf cover is made from vintage fabric patches, each pouf cover is unique. There will be VARIATION in the patches however the BASE COLOR of the pouf cover will REMAIN SAME. There may be slight imperfections due to the products handmade nature which makes the product unique and different from other pouf covers. If you have any questions about this product by Stylo Culture, contact us by completing and submitting the form below. If you are looking for a specif part number, please include it with your message.